Personal computing and technology has been an integral part of progressive businesses for at least twenty-five years now. As business owners and managers, we have grown accustomed to dealing with technology, and most of us have created a set of rules that we play by. Are these rules the right ones? They have worked okay so far, right? In working to grow business at CT, we regularly contact business owners and managers who are not our customers, and ask them about how they view technology and what is important to them. Most decision makers, when asked about their technology, reply that their current method of handling things is “fine”. In fact, the consistency with which we get this response is amazing. So much so, that I find myself scratching my head and wondering how is it possible. When digging further, we even find great consistency in how people define “fine”. “Fine”, to most decision makers means that they are not down, and that if they do have a problem, their current technology support guy, company, or maybe even their brother-in-law responds fairly quickly. Seems pretty logical, right? What more could one ask? I say this with a little bit of cynicism, because I am, after all, in the tech business. I think my cynicism really comes from understanding the business world, as well as understanding technology. Technology, for most businesses, is what drives our business to the finish line. It is not just important, but critical to our business. We are competing in a race to be better than our competitor, with the goal of having more customers choose us. The real problem with being satisfied with a technology platform that is “fine”, is that “fine” is not the vehicle that will get us to the finish line in a fashion that wins us the race. It won’t give us that edge to win. It won’t improve our profitability. It won’t help provide service that WOWS our customer. It won’t help attract the brightest employees and help retain them. So what does it take to get to the next level as far as technology goes? How does a business subscribe to a technology approach that goes beyond the status quo and has a positive impact on their business? There are many larger businesses out there that have this positive energized view of technology and employ strategies and tools to get them there. Most of them have a team of IT specialists and a CIO that set direction and implement. Having a progressive on-staff IT department of this type is not practical for most small and medium sized companies. The know-how and discipline to do so is not the focus of the company and directing IT strategy is not their specialty. Over the last couple of years at CT, we have been working on developing and improving a disciplined, managed approach to IT that we call CT Complete Care. We believe that this approach to IT solves this problem. It allows for even a smaller organization to have a fully engaged IT initiative that delivers real bottom-line results. We have been providing IT services for over 20 years now, and over the years we have seen a lot. Most IT service providers are entirely reactive. There are three types of service that are typical in reactive mode. First, in an emergency, we drop everything and help our customer get things operating again. Second, someone at the customer site keeps a list and calls us to work on things when the list gets too long or too urgent. Or, we may have a regular appointment to handle a list of reactive items. Finally, we meet occasionally about a project that needs to be completed like a new server, new backup solution or adding a new office. These few sentences encapsulate the typical IT provider relationship. It is totally reactive, and mostly negative. The customer calls for help when things are broken. The IT vendor provides service, and sends a big bill. Often lots of things fall through the cracks. Imagine things just a little bit differently. First, imagine a Virtual CIO for your firm who would look at the big picture and help plan out your technology initiative. What if this CIO would conduct regular meetings to help set technology direction for your company; would bring new technology to you that might impact your business for the positive; would help set a yearly technology budget; would assist with growth and expansion plans; and would oversee technology in your organization. Having a Virtual CIO for your company insures that you are taking the proper course and that you are taking advantage of the technology that is out there to put you ahead. Second, imagine a System Administrator that would help your firm develop and implement best practices for your organization and oversee your network policies and procedures. What if this system administrator had real world experience and could help with important objectives like creating an overall security policy? What if they could provide a coherent strategy for things like blocking SPAM and spyware? What value might there be in a cohesive strategy for email and document retention? What if this system administrator could help you establish a disaster recovery plan for your organization? Policy and procedure is one of the most overlooked and yet necessary things for the small business. 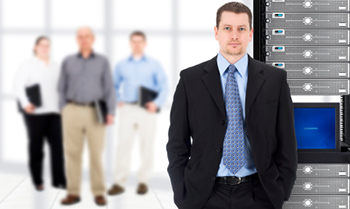 Establishing and implementing policy for your organization is the strength of the System Administrator. Imagine Proactive Maintenance done systematically. What might it do for your people if their computers always operated at peak performance? How might the productivity of your team improve if all of the maintenance tasks that should be completed, actually are? The goal of proactive maintenance is to insure that everything that can be done to make each part of your network operate at peak efficiency is done, and to insure that your network stays secure. This rarely happens consistently and usually only happens when someone complains about issues with their machine. Loading patches, insuring security is in place, defragging machines, cleaning up temporary files, and checking disk space are just a few of the key proactive measures that should be done and are with Proactive Maintenance. Imagine a Help Desk Team that would respond to technology issues that your employees might have. What if this virtual help desk was directly accessible to each employee, and they could respond to each employee’s problem individually by simple remote access to their desktop? What if each of your employee’s trouble-tickets were logged over the web, easily accessible for review, and easy to track? Allowing each employee self service access to IT support, improves their ability to improve their own work platform, and lets them get help without interrupting someone else in your organization. Help Desk Services insure that your team can get help when they need it, and allows them to operate and complete their job successfully without the frustration of less accessible methods. Maybe this all seems too good to be true, or maybe to some of you it seems like over-kill, and still others are skeptical of cost. The good news is it is available. We have developed a discipline and structure around providing this kind of service. We have management tools and software that automate much of the day to day maintenance, and we have a team of individuals who are qualified and eager to provide this kind of service.